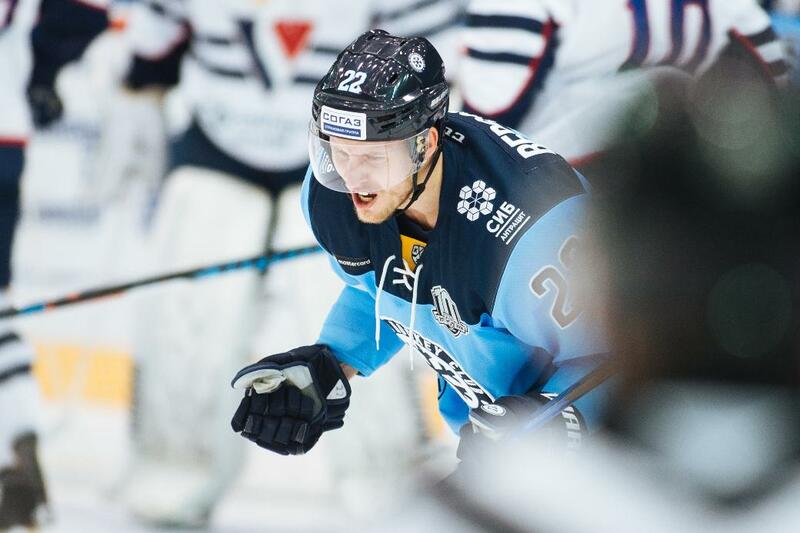 The man named as the League's finest forward for December, Sibir’s Alexander Bergstrom, spoke to KHL.ru about the Novosibirsk team's playoff hopes, his recent scoring streak, and of playing under coach Vladimir Yurzinov. On Thursday, at the Vladivostok home of Admiral, with a mere 15 seconds of the third period remaining, a goal by Alexander Bergstrom tied the match to complete a stirring late fightback from 0-2 down. Rok Ticar struck the game-winner 112 seconds into added time, and the win lifted the Novosibirsk Men above Amur and into that precious 8th playoff place in the Eastern Conference standings. The goal also extended the 31-year-old Swede's scoring streak to 12 games, and he now needs only five more to match the KHL record. - Alexander, please tell us about your most recent game, in Vladivostok. - It was not our best game, and for the first two periods we simply weren't good enough. In the last ten minutes we played better and put the opposition under more pressure. I was fortunate to score at the end, but we shouldn’t play like this. Maybe next time we won’t be lucky enough to turn things around. - Was it a lack of motivation from your side? - Our motivation was good, but right from the start we struggled to find our rhythm. - Anyway, you have now scored points in twelve straight games. Is it the first time in your career? - Yes. A couple of times at the lower levels I took points from nine games in a row. It’s good that I've managed to help the team in this way, as we’re fighting for a place in the playoffs. - The record is seventeen games, set by Alexander Radulov. - It’s a tough record to beat. We don’t score a lot of goals, so it’s hard, as I'm sure you know, but I’m not focusing on that record; I just want to help the team. Some nights it’s hard to play. Last night we were losing with only 15 seconds left on the clock, so we need to play better. - What changes has head coach Vladimir Yurzinov introduced? You scored in the first seven games under the new coach. - I have great linemates and they create chances, supply the passes for my goals, and in fact, the whole team played better over the last few games, so it;s been easier to score. Yurzinov arrived and we started winning. He’s a kind, calm guy, and he tries to calm us down so we can devote all our energy to the things we do out on the ice. - For December, you were named the best forward of the month. - It’s very special. I never imagined that I could be the best among all the great players that we have in this league. - Does the team believe it can make the playoffs? - We have to believe. We’ve been battling all season on or around the threshold of the playoffs. We have real belief, and our fans deserve it. - Is Novosibirsk a real hockey town? - Yes, a real hockey town. The home games are amazing. The support from the fans is something special. All guys in the team feel it. We love each and every home game. - Was it hard decision to come to the KHL after spending all your career in Sweden? - I wanted to try the KHL. It was an easy decision when I got the chance, it’s very enjoyable for me to try something new. I was playing at Karlskrona for four years. I enjoyed it there, and leaving was a bit of a wrench because I like the team and I still cheer for them, but my family is with me in Novosibirsk and we’re happy. - Your career is progressing very fast, and you have been performing superbly in the KHL. - It's all been a little strange. I have always tried to believe in myself and that I could play in a better league. Back at Karlskrona, when we wom promotion from the Allsvenskan to the SHL, I was convinced I could perform at the higher level, and I came to the KHL with the same attitude. After I had about 20 games under my belt, I had the measure of playing here, but I should say a word of thanks to Patrick Zackrisson, who helped me out a lot. Every guy has a different career path. You need to take pride in never giving up. If I could set such an example for the young kids, I would be happy with that. - And it's very likely that you're going to the Olympics. - Of course that would be amazing. There is very stiff competition just for a place in the roster, but it would be great If I made it.